You probably have seen a mat that can float on water. If you haven’t, then maybe you have an idea of what the thing looks like. Floating water mats give a good relaxation experience, be it in your home pool or right out there in the sea. Choosing the right water mat is no easy task. There are many different types available out there ranging from inflatables to foam water mats. Different sizes, weight capacity, and extra-features add more headache to the selection process. What’s more, there are many different brands to factor in. Well, we’re here to save you the trouble. This article reviews the best floating water mats and the features that make them stand out. Curious about knowing which one will match your needs? Well, read more to find out. This heavy-duty floating water mat is made of 30 gauge PVC to provide full support. The mat measures 10 x 6 feet, which is large enough to fit up to 6 people. A zippered connection lets you attach several mats together to form one large walking island. Each end of the mat has a grommet where a rope is threaded through to tie to a boat. The mat can be deflated to let you pack and carry with ease. The deflation process is quick and takes just around 5 minutes. This giant water pad can hold up to 1,200 pounds. The pad has a Tuff-Hide outer membrane, which is good for surface protection. Apart from providing surface protection, the membrane offers good resistance against dirt and grime. The inner part of the pad is made of tough nylon to resist rips, punctures, and lacerations. Vibrant orange and green colors give good visibility for added safety in high-traffic areas. The pad rolls easily and has Velcro straps that secure it for easy storage and transportation. O’Brien Water Carpet lets you relax and soak in the sun. The carpet is large enough to hold up to 6 people, which is a good thing for a family to hang on. It is large yet a great space-saver when it comes to storage. It rolls easily into a compact size for storage. This water carpet comes with grommets for tethering. The blue color makes it easy to pick out in high traffic waters. This water mat is built with safety in mind. The bright yellow color gives high visibility. The mat is made of high-density foam, a construction that is virtually maintenance free. The foam gives good buoyancy to hold up to 1,250 pounds, which is an ideal weight capacity to hold up to 6 adults. This water mat comes with a mooring device on which it is secured. This is a lightweight floating water mat. An easy-roll construction and the lightweight design makes it easy to transport. The mat is made of a sturdy, cross-link foam material. The foam gives good buoyancy and resistance to rips and tears. This mat has grommets that provide points for attachment. It comes with colorful graphics that add more fun. This is a great lounge mat for both kids and adults. It is made of dense, marine-grade foam for maximum longevity. 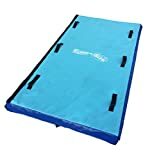 The foam construction gives a lightweight and puncture proof water mat. In short, this floating water mat is virtually maintenance free. It doesn’t degrade in the sun and gives good buoyancy to hold up to 250 pounds. The mat unrolls in seconds and comes with a Velcro strap to secure it once rolled. A tethering kit is included to secure it to a boat. Big Joe Waterpad mat lets you unwind right in the comfort of your pool. It is a large mat that fits up to 4 adults. The mat is made of maintenance-free EVA foam. This keeps it lightweight and puncture-proof. The mat has four cup holders that hold your drink. There is a mooring line designed for tethering. 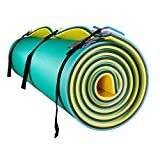 The mat rolls easily and has Velcro strap that secures it for easy storage. This is a worry-free floating water mat that can be used for all seasons. It is a multi-purpose mat that can be used for water and snow. A foam bean interior gives good buoyancy. The mat is covered in tough vinyl to provide a good protective membrane. Velcro straps are fitted along the edges to connect two or more mats. Six sewn-in handles give you an easy time when towing or sledding. The mat folds up for easy storage when not in use. It is a good option for those that don’t have time to inflate their mats. 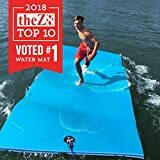 This is a durable, 3-layer floating water mat. It has a foam layer, UV resistant layer, and heat-laminated layer. The 3-layered construction makes it one of the thickest water mats, which gives a high level of buoyancy. The mat measures 16 x 6 feet to give enough room for relaxing. Both sides have D-rings where carabiner clips attach. A bungee cord is included for easy tethering.